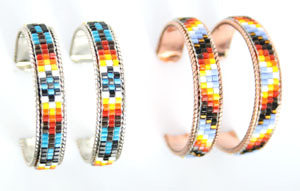 Navajo crafted assorted color beaded large hoop earring. It measures about 1/4" wide and hoop is about 1 1/4" in diameter. Beaded on nickle silver or copper. Crafted by Geraldita Whitehorne. Choose metal when ordering.